©Betsy Malloy Photography. Used by Permission. 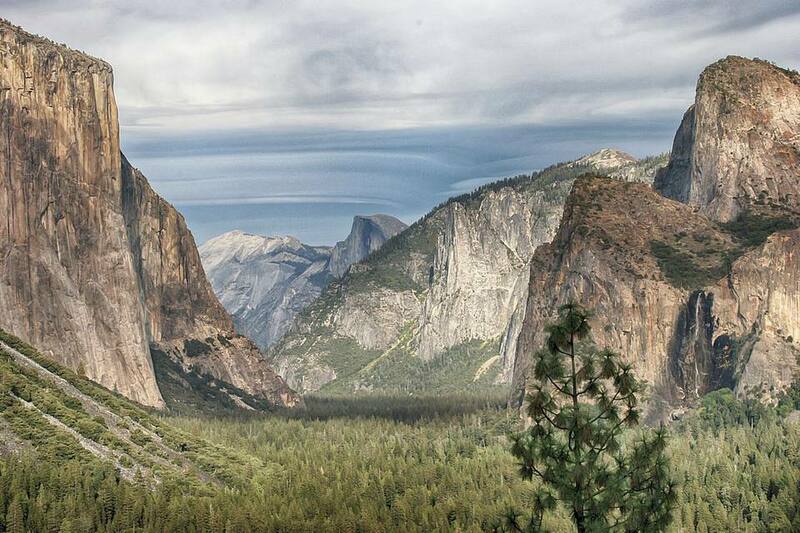 The vista point where this iconic Yosemite Valley view can be seen is just below the tunnel on Wawona Road. If you enter through CA Hwy 41 (Oakdale and Fish Camp), you'll drive through the tunnel toward Yosemite Valley. If you came in through the other two western entrances, it's a short drive up Wawona Road from Southside Drive. Coming in on Big Oak Flat or El Portal Road, Fern Spring is just past where the road into the valley splits into Northside and Southside Drives. If you came in on Hwy 41, you'll have to circle the valley and turn back into the park to see it. This pretty waterfall is very small, in the shade and usually lightly visited. Unless you stop to photograph it. While I was making this shot, at least a half dozen groups of people stopped and tramped around right in front of my lens. During a lull in the traffic, I got out a flashlight and applied the pretty gold-colored light to the falling water. Bridalveil is one of the valley's two most spectacular waterfalls and in most years, it keeps running through the summer. I like how this photograph captures the way the wind plays with the falling water, spreading it out like a bride's wedding veil and even pushing the whole thing to the side. you can park beside Southside Drive and walk to its base. I'm not normally a big fan of black and white photos, but this one shows the rock texture on El Capitan so well that I couldn't resist. The granite monolith is 3,000 feet (900 m) tall. It's a popular place with rock climbers and you can often see them on the rock if you have binoculars. You can see El Capitan from the same place where you park to see Bridalveil Fall. Just a little further along Southside Drive is Cathedral Beach, a pretty spot (as you can see) and a nice place for a picnic. ©2013 Betsy Malloy Photography. Used by Permission. Yosemite's signature rock formation is easy to recognize by its shape and the little "beak" of granite at the top. You can see it from Southside Drive and there's a nice view from the bridge where Sentinel Drive crosses the river. Its peak is more than 4,737 ft (1,444 m) above the valley floor. Half Dome is popular with hikers, but it's not for the unprepared. You need a permit - and the right gear. This little chapel is popular for weddings. It's been around for well over 100 years, making it the oldest structure in the park. Church services are held there weekly. The Ahwahnee is one of the grand national park lodges, designed by architect Gilbert Stanley Underwood, who also designed the Zion, Bryce Canyon and Grand Canyon North Rim Lodges. It was built in 1927. The exterior is rustic, with lots of stone and concrete, which was poured into a mold and stained to look like natural wood. In March, 2016, the National Park Service hired a new concessionaire to replace DNC who had run the park for many years. As it turned out, DNC has trademarked the name Ahwahnee and the hotels name was changed. There's an ongoing dispute about the name and we hope DNC will do the right thing and let the historic hotel have the name back that it has had since the 1920s. Until things are settled, it's still the Ahwahnee to us. The hotel is very popular with visitors, but I like its big public spaces better than its rooms. You'll see why in the next photo. More About the Ahwahnee in the hotel profile and review. This lounge is so pretty and comfortable-looking that you might just get sucked into staying there for hours. And why not? You're on vacation, aren't you? Yosemite Falls is the highest measured waterfall in North America and one of the world's biggest, falling 2,425 feet (739 m) in two stages. this view was taken from across the valley, where it's easier to see the whole falls. On Northside Drive, you can park near Yosemite Lodge and hike up to its base. This is a sight few people get to see, a lunar rainbow formed by the light of the full moon in the mist rising from Yosemite Falls in the spring. If you were there, you'd see a glow, but wouldn't see the color. The human eye can't see colors in such low light, but the camera can, showing you the full spectrum. If you're driving out of Yosemite on Northside Drive in the spring, you'll find dogwood like this blooming beside the road. This blossom has four petals, but this is a mountain dogwood and some have more. This view up the Merced River into Yosemite Valley is one of the iconic shots. You can see the profile of El Capitan on the left.